The Louisville metropolitan area or Kentuckiana, also known as the Louisville–Jefferson County, Kentucky–Indiana, metropolitan statistical area, is the 45th largest[b] metropolitan statistical area (MSA) in the United States. 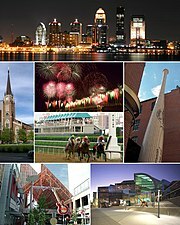 The principal city is Louisville, Kentucky. The Elizabethtown–Fort Knox, Kentucky, MSA, consisting of Hardin and LaRue Counties. The Bardstown, Kentucky, micropolitan statistical area, consisting of Nelson County. The Madison, Indiana, micropolitan statistical area, consisting of that state's Jefferson County. In 2003, the Jefferson government merged with that of its largest city and county seat, Louisville, forming a new entity, the Louisville–Jefferson County Metro Government (official long form) or Louisville Metro (official short form). All small cities within Jefferson became part of the new Louisville Metro government while retaining their city governments. For statistical and ranking purposes, the United States Census Bureau uses the statistical entity Louisville–Jefferson County metro government (balance), Kentucky, to represent the portion of the consolidated city-county of Louisville–Jefferson County that does not include any of the 83 separate incorporated places (municipalities) located within the city and county. ‡Prospect lies in both Jefferson and Oldham Counties. The portion within Jefferson County is part of Louisville Metro. Populations are based upon published estimates by the United States Bureau of the Census. ^ Named Louisville, KY-IN Standard Metropolitan Area (SMA) in 1950, Louisville, KY-IN Standard Metropolitan Statistical Area (SMSA) from 1960 to 1981, and Louisville, KY-IN Metropolitan Statistical Area (MSA) from 1983 to 2003. ^ a b c d e f g h i j k l m n o p q r s t u v w x y z aa ab ac ad ae af ag ah ai aj ak al am an ao ap aq ar as at au av aw ax County was not a part of Louisville, KY-IN MSA at the time of this Census and the county's population is not included in MSA total. ^ County is no longer included in the MSA as of 2016[update]. ^ Named Louisville–Elizabethtown–Scottsburg, KY-IN CSA from 2000 to 2003, and Louisville–Jefferson County–Elizabethtown–Scottsburg, KY-IN CSA from 2003 to 2013. ^ a b c d Census defined area did not exist during this Census. Population totals are for counties included in 2000 Census MSA or CSA estimates. Population is shown for comparison purposes only and should not be used as a reference. ^ a b c d e f g County was not a part of Louisville, KY-IN MSA at the time of this Census and the county's population is not included in MSA total. ^ Named Elizabethtown, KY MSA from 2000 to 2013. ^ a b This county was part of the Louisville MSA in the 2000 and 2010 Censuses, but has since been spun off into its own statistical area. Its population is included in the MSA total for those censuses. ^ a b The United States MSA table excludes the San Juan, Puerto Rico MSA which has a higher population than Louisville. ^ "Annual Estimates of the Resident Population: April 1, 2010 to July 1, 2015". United States Census Bureau. U.S. Census Bureau, Population Division. March 2016. Archived from the original on April 17, 2016. Retrieved April 5, 2016. ^ "Table 1. Annual Estimates of the Resident Population: April 1, 2010 to July 1, 2015 – United States – Combined Statistical Area; and for Puerto Rico". 2015 Population Estimates. United States Census Bureau, Population Division. March 2016. Archived from the original on April 17, 2016. Retrieved April 5, 2016.